The California Veterinary Medical Board (VMB) is making rules to regulate the practice of animal rehabilitation (AR) in California. Their original plan would only have allowed veterinarians to provide independent animal rehabilitation regardless of their level of training in the specialty field of rehabilitation. Even the most qualified AR practitioners, licensed Physical Therapists with advanced training in AR, would have had to work directly for a veterinarian. Furthermore, that veterinarian would have had to have been your pet’s veterinarian or you would have been subject to additional exam fees by the veterinarian on the same premises of the qualified AR practitioner. As mentioned above, any veterinarian, or RVT working for a veterinarian, would have been allowed to practice AR – even if he or she had no training in the field. Animal rehabilitation is a specialty niche of animal healthcare not currently part of the standard vet curriculum. Allowing any veterinarian or RVT to render rehab services for which they have no qualifications might have resulted in injury to animals. Restricting consumer access to animal physical therapy, and requiring that it only be performed in a veterinarian’s office, would significantly increase consumers’ cost for these services, would generally reduce the quality of these services, and most importantly, would take away the consumer’s right to choose who treats their animals. To date, we have been successful at stopping the California VMB and the California Veterinary Medical Association’s (CVMA) multiple attempts to pass both regulatory and legislative language to restrict consumer choice and limit access to qualified non-vet rehab practitioners. We seek to take a leading role in defining appropriate regulatory or legislative language to protect the consumer’s right to choose, while protecting animal safety through mandatory educational standards for all those who practice in the specialty niche of animal rehabilitation. Physical therapy for animals includes the physical therapy examination and evidence-based treatment, in collaboration with the veterinarian of record and client/owner/handler, to detect, assess, prevent, correct, alleviate, or limit physical disability, movement dysfunction, or pain from injury, disease and other bodily conditions. Physical therapy for animals does not include chiropractic (musculoskeletal manipulation) services, nor does it include making a veterinary medical diagnosis. For many years, physical therapists have established collegial, successful relationships with veterinarians to provide the highest quality of physical therapy services to animals through either veterinary referral or indirect veterinary case management. Other states have adopted practical regulations to support these practices, including Colorado, Nevada, and Nebraska where animal rehabilitation is provided by licensed and qualified physical therapists who operate on their own premises but with appropriate supervision by a referring veterinarian. We believe that California should follow this model. Specifically, CAAPT proposes a regulatory model in which only properly qualified individuals are permitted to practice AR. 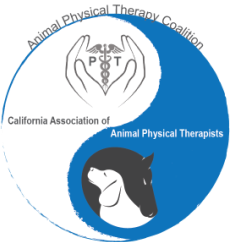 Such qualifications would include licensure in physical therapy by the California Physical Therapy Board (PTB) as well as additional advanced training in animal rehabilitation (the CCRT/CCRP or its equivalent). Veterinarians or vet technicians would be required to undertake the same advanced training before being considered qualified to practice AR to ensure competency and consumer protection. Further, we propose that the provision of animal physical therapy services be permitted only after a veterinary examination has been completed, followed by a written veterinary medical clearance indicating that it is safe for the animal to undergo physical therapy. Physical therapists practicing on humans are accustomed to providing care for patients together with the primary physician through regular communication. By utilizing a similar approach with animals, clients are able to access the highest quality of care along with continued veterinary oversight to ensure patient safety. Finally, we believe that all premises that would be run by these qualified non-vet practitioners should be subject to premise inspections to provide another added layer of consumer protection. A qualified physical therapist should be allowed to carry a premise permit, and the premise permit should not serve as a barrier to allow these practitioners to operate. We are currently aligned with leading professionals in the field. We are seeking like-minded individuals and organizations to come alongside us as we lead the development of regulatory and/or legislative language that will protect consumers’ rights to choose their own qualified animal rehabilitation professional. In particular, we need funding to cover fees for lawyers and lobbyists, as well as travel expenses associated with attendance at political events and meetings. We invite you to join us in our quest to do what is right for the animals and consumers of California. Please contact us to learn more. "California licensed physical therapists with advanced certification in Animal Physical Rehabilitation (with such certification to be defined by the Veterinary Medical Board and the Physical Therapy Board working cooperatively) may provide Animal Physical Rehabilitation under the degree of supervision to be determined by the veterinarian who has established a veterinarian-client-patient relationship on a veterinary premises or an Animal Physical Rehabilitation Premises (as defined in regulation by the Veterinary Medical Board and the Physical Therapy Board working cooperatively), or a range setting."